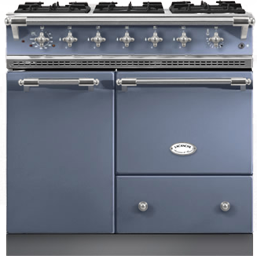 Bussy is the newest addition to the Lacanche family, and brings all of the craftsmanship and exceptional quality you have come to expect of Lacanche into a standard 36"-width range. 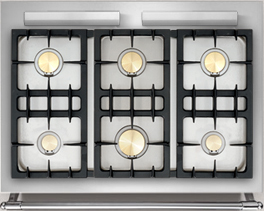 With 6 stepped burners and 2 ovens, Bussy is no compromise and is sure to impress your guests and family! On Bussy, the vertical oven is on the left. 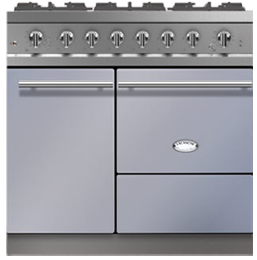 Its sister range Beaune shares the same configuration but with the vertical oven on the right. Bussy-Rabutin is a small village in the heart of the Auxois region, in Burgundy. Built in the 12th century and finished in 1649, the Chateau de Bussy is open to visitors year-round and let you enjoy its splendid Jardins a la Francaise, restored and recreated to their original beauty. The 6 stepped burners give you complete control over your cooking, from low-heat simmering to high-heat sauteing. The two simmer burners (5,000 BTU) are perfect for delicate sauces. The 3 - 11,000 BTU rear burners are ideal for almost any style of cooking, while the large central 15,000 BTU burner will bring a large pot of water to a boil in no time!